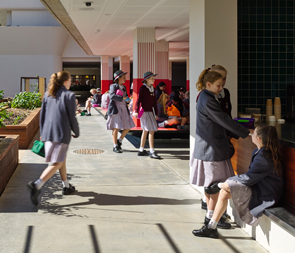 Mount Alvernia has a distinguished music program delivered through the Mount Alvernia Centre for Music Excellence. Our Music program encourages all students at Mount Alvernia College to participate in musical activities. We are proud of our musical culture – one that has a positive impact on our students’ lives. Our students enjoy personal and musical development through sharing their musical experiences within the many opportunities available to them at the College. The Franciscan Colleges Instrumental Programme (FCIP), run in collaboration with Padua College and St Anthony’s School, is designed to give our students the opportunity to learn a musical instrument and perform in one of the many bands, orchestras and other ensembles run as part of the Programme. The FCIP offers students a number of different ensembles to accommodate a wide range of individual abilities and the various genres of music performed. All members of FCIP ensembles are expected to be committed to their ensemble, ie to do regular home practice, to attend all timetabled lessons, tutorials and rehearsals, and to be available for FCIP performances. The Mount Alvernia Voices Choral Program offers students the opportunity to experience and excel in choral singing through a diverse range of musical styles. Many of the choirs have achieved significant success, regularly achieving Gold Awards at the Queensland Catholic Colleges Music Festival. In addition, the choirs have toured internationally to Singapore, Malaysia, and the United States to great acclaim. The choral programme offers a number of ensembles to suit student need. The College offers private music tuition in voice and piano. These lessons are run by industry professionals, and students have the ability to complete AMEB exams. Lessons are half an hour in duration and in most cases are rotated weekly so students do not miss the same school lesson consecutively.